Joy Creek Photo Archive (c) all rights reserved This surprisingly vigorous Barrenwort is the result of a cross between E. acuminatum and E. fangii. Long, arrow-shaped leaves have lightly spiney edges. In the spring they are colorfully mottled in red-brown. The flowering stems are at least two feet in height and can carry up to fifty two-inch flowers. 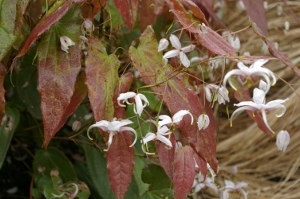 Because Epimedium x omiense is evergreen, it promises all-season interest. Spring. 18 in. x 2 ft.